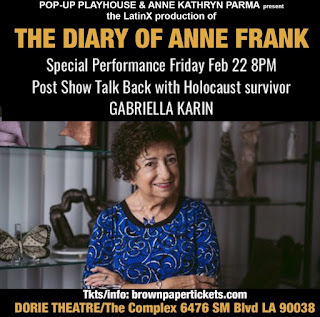 The Diary Of Anne Frank running through February 24, 2019, at The Dorie Theatre at The Complex. Located at 6476 Santa Monica Blvd. Los Angeles, CA. 90038. Performances will be Friday & Saturday 8:00PM and Sunday 3:00PM. General advance admission is $25. Reserved advance seating is $35.